Power of CodeGate in a high-density laser barcode scanner. 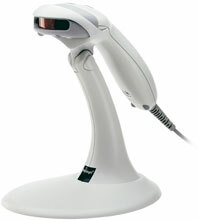 The Metrologic MS9541 Voyager HD is the scanner of choice for all high-density barcode scanning needs. With the use of CodeGate, the MS9541 Voyager HD is ideal for retail point-of-sale, light warehousing or health care applications. The MS9541 Voyager HD decodes high density barcodes with a minimum width of 0.076 mm (3.0 mil), as well as all standard 1D, RSS-14, RSS Limited and RSS expanded barcodes. Features like automatic trigger operation, custom editable barcode data, user-replaceable single cable interface to host, bumper-to-cable warranty and easy-on-your-wallet prices makes MS9541 Voyager HD the favorite among high-density barcode scanners. The proprietary CodeGate used in MS9541 Voyager HD gives ultimate control in its various applications. The Metrologic MK9541-32A38 is also known as Metrologic Instruments	MET-MS954132A38	or MK954132A38	.